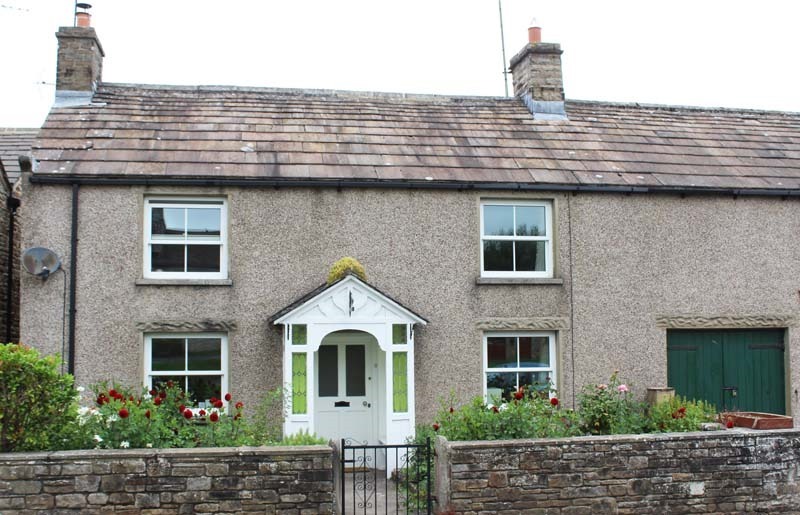 The new national energy efficiency regulations for rented property will have a major impact upon Dales’ communities Aysgarth and District Parish Council was told at its July meeting. The chairman, Cllr John Dinsdale, reported that when he contacted local estate agents he learnt that 14 properties which had previously been rented had now been sold, some probably for second homes. “We can’t lose so many rented properties,” he said. He had invited Bernard Spence to describe what it had been like trying to bring a rented property up to the required standard so as to obtain an Energy Performance Certificate (EPC) rating of at least band E.
Mr Spence explained that the new regulations had come into force in April this year and an estate agent had informed him that his property in Aysgarth (above) could not be advertised for let until it had been upgraded. Like many properties in the Dales this is an old stone-built house and so is especially difficult to upgrade to modern standards. District councillor Yvonne Peacock said she would discuss the issue with the legal department at Richmondshire District Council. “We need to keep young people living and working in the Dales,” she said. The issue will also be brought to the attention of the Yorkshire Dales National Park Authority by District councillor Caroline Thornton-Berry. Reading Room. – The council was informed that at an extraordinary meeting of Thoralby Parish on June 18 it had been decided that a grant of £10,500 should be made from the Thoralby Moss account towards the cost of repairing the village Reading Room. Cllr Brian McGregor also reported that at a Thoralby Parish site meeting it had been agreed that it was not feasible to create a car parking area in Low Green Lane as there was insufficient ground area. Westholme. – The council received the following response from the Yorkshire Dales National Park Authority concerning the trees that had been felled at Aysgarth Luxury Lodge Holidays (previously Westholme Caravan Park):“After checking that this isn’t a conservation area and that there are no TPOS in force, the matter [was referred] to our Senior Trees and Woodlands Officer who referred onwards to the Forestry Commission given the amount of felled wood. Thoralby – Cllr McGregor told the meeting that Low Green Bridge needed a hand rail and netting or chicken wire as its surface was slippery. North Yorkshire County Council’s highways department reported that following an inspection it did not consider that the railway sleeper-type bridge needed to be replaced at present. Cllr McGregor reported that the new tarmac on the road from Aysgarth Garage to Thoralby was 50 yards short of Tom Gill bridge where the road surface most needed to be repaired. Aysgarth. – The highways department had informed the council that the speed limit sign on the west side of Aysgarth was past its sell by date and needed to be replaced. A new vehicle activated sign will be installed during the present financial year. The clerk will ask the highways department if it will install bollards outside Flatlands or if this could be done by a resident. The council agreed that bollards are needed to stop cars being parked on the grass verge. The highways department will also be informed about the bushes which are overhanging Dyke Hollins Lane near the Doctors’ Surgery as these were scratching cars. The chairman, Cllr John Dinsdale, was thanked for repairing and varnishing benches. He said that the bench by the bus shelter in Aysgarth was beyond repair and so the Coronation plaque would be moved to another one. Next meeting. – will be in Aysgarth Institute at 7.30pm on Thursday September 13.